Seattle Bubble spreadsheets are updated even when content isn’t frequently posted. You can get access to the spreadsheets by becoming a member of Seattle Bubble. 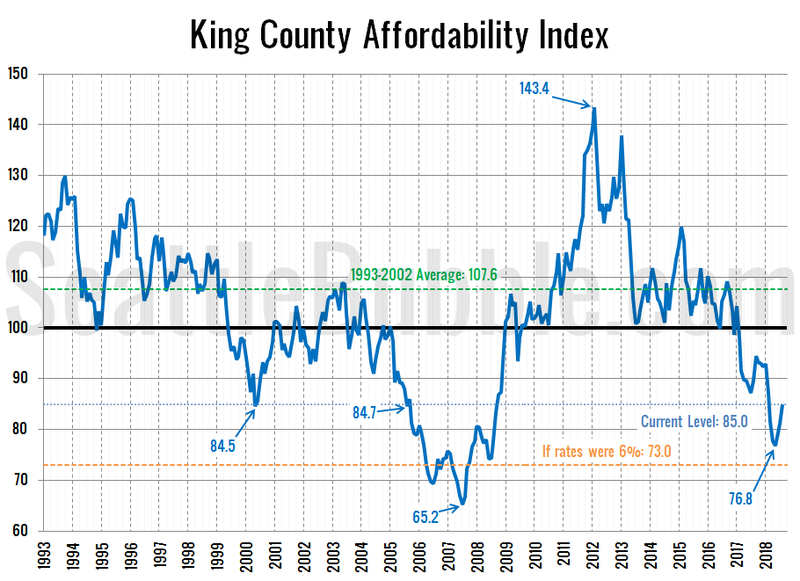 By popular request, let’s take a look at our affordability index charts for the counties around Puget Sound. As of August, the affordability index has bounced up slightly from its May low (which was the lowest point since nearly a decade ago in July 2008), but still sits at the very low level of 85.0. For context, eighty-six percent of the 306 months on record back through 1993 have had a higher affordability index than what we had in August 2018. An index level above 100 indicates that the monthly payment on a median-priced home costs less than 30% of the median household income. I’ve marked where affordability would be if interest rates were at a slightly more sane level of 6 percent—73.0, which is worse than any point outside of the peak bubble years of 2006 and 2007. If rates went up to a more historically “normal” level of 8 percent (the average rate through the ’90s), the affordability index would be at 59.1—six points below the record low level that was set in July 2007. The entirety of the bump in the affordability index over the last few months is due to slipping home prices, which peaked in May at $726,275 and have since fallen $57,275 to $669,000. I suspect that the near-record-low levels of affordability may be a big factor in why sales have slowed (and thus inventory has increased) this year. 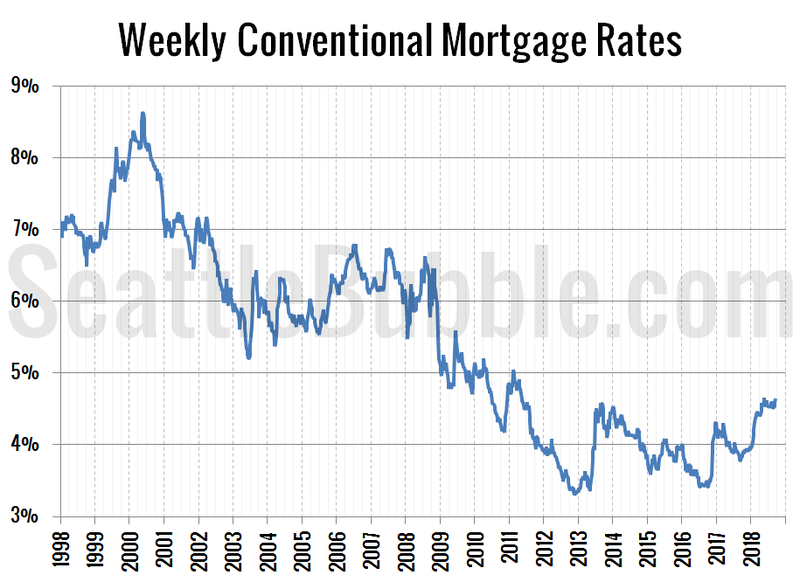 Meanwhile, while mortgage interest rates did climb late last year and early this year, they have been relatively stable over the last few months. 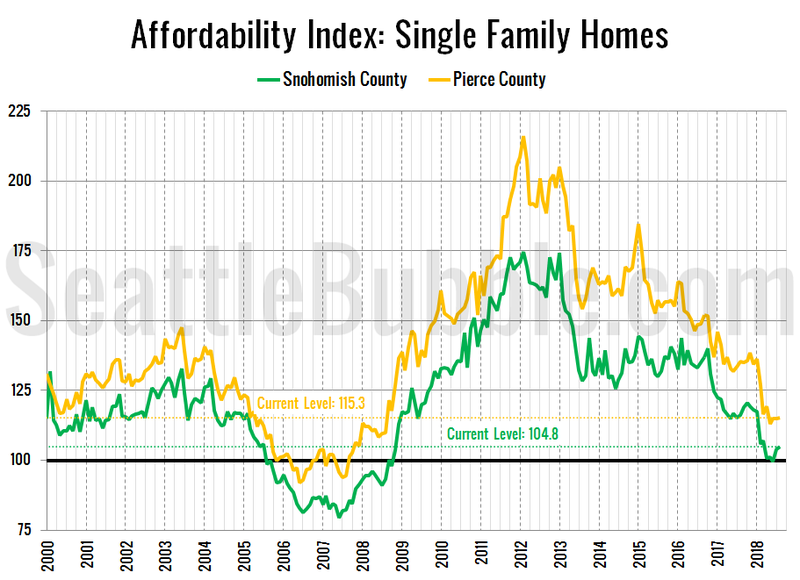 The affordability index in Snohomish currently sits at 104.8, while Pierce County is at 115.3. Both down considerably over the last few years, and at levels comparable to late 2008. You can calculate whether a home purchase scenario is “affordable” using the Affordability Index measure with my simple affordability calculator. Tomorrow I will post updated versions of my charts of the “affordable” home price and income required to afford the median-priced home. 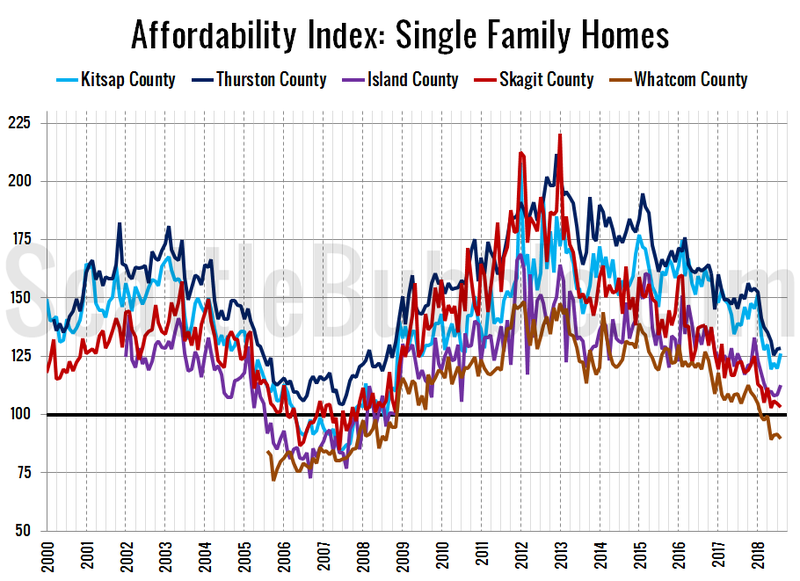 Hit the jump for the affordability index methodology, as well as a bonus chart of the affordability index in the outlying Puget Sound counties. As a reminder, the affordability index is based on three factors: median single-family home price as reported by the NWMLS, 30-year monthly mortgage rates as reported by the Federal Reserve, and estimated median household income as reported by the Washington State Office of Financial Management. 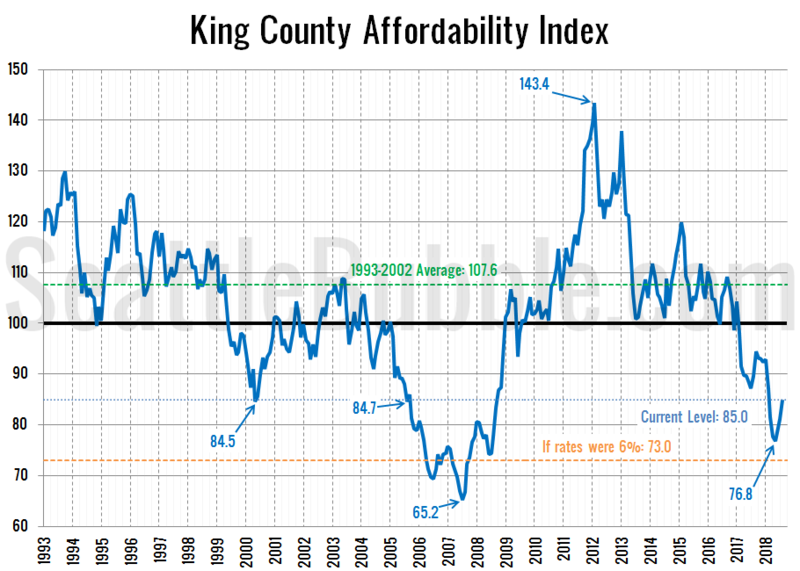 For a more detailed examination of what the affordability index is and what it isn’t, I invite you to read this 2009 post. Or, to calculate your the affordability of your own specific income and home price scenario, check out my Affordability Calculator. Looks like the market still has 2-3 years to go before a crash like 2008 – 2009.
btw: We’re starting to use Tableau in our office… finally! Housing market is starting to fell the effects of Trump’s idiotic trade war. Trump’s own people think he is an idiot. Great charts. Looks very different from 2009 where interest rates rising did not correlate with price reductions. So that was a real bubble. If rates even just slowly inch up over time it means that house price declines are one way to affordability. Also the impact of an interest rate increase on affordability is greater when the price of the home is higher which is presently the case. Is anyone in the Fed think tanks advocating for lowering the rates again? RE: pfft @ 3 – The prior thread went over 100 posts without anything political. Trump was mentioned a couple two three times, but it was in the context of his investment results. It was one of the best threads in months if not years. Unfortunately this thread only made it three posts before pfft/greg pops in with some completely unsupported claim about Trump and our local market. Here’s another part of the inventory puzzle. Cancelled/expired King County SFR are both up about 40% YTD and about 60% in August. The numbers are not huge, an increase of about 700 for both collectively YTD, but none of these statistic changes are huge (closed sales are only down about 1,200 YTD and new listings up about 1,400 YTD). The surprising thing to me was that there were so many cancelations back in 2017, but again note some of those cancelations are really just price change situations (with or without agent fines). The reason I ran this though is I have recently seen a number of cancellations after only a short time on the market, as if the sellers stuck their toes in and didn’t like what they were feeling. Oh, and as to the numbers not being huge, the headline for this piece is a bit much. Sales for YTD being down about 1,200 and less than 20% for August is hardly “stalling.” Slowing would have been a better term. Numbers from NWMLS sources, but not compiled by or guaranteed by the NWMLS. Firstly, we’ve always had a trade war with China, the last few decades…look at the trade deficit numbers. Trump didn’t start the Clinton[?] Trade War at all, he’s trying to cure the past. I talked to a wonderful east European at Toastmasters Thursday who’s moving to the Midwest states…she told me Seattle’s high property taxes was the main reason. RE: softwarengineer @ 8 – SD and WY are the only two states near the Midwest that don’t have an income tax, so hopefully her income is not too high. Seems like a silly reason to move, although I can see other reasons to move. I’d at least wait until finding out what taxes are next year before going to the expense and hassle of moving. Your E. European is confused. Affordability is THE key issue/need to correct our Housing Ecosystem…dumb State Condo Laws, Growth Management Act, Zoning, Permitting and other Legislative impairments to allow for more affordable homes and different home types impede it immensely…this next Olympia Session is THE Critical Time to address a Holistic correction to many of these needs and poorly performing policies for our Communities and Citizenry. We can do it….there’s Pain now being felt across many spectrums on the housing shift/correction we’re seeing….From Individuals and Families to renters to owners to investors to developers to employers whose own bottom lines are directly affected by their chief costs of Labor and that Labor’s chief cost, housing…becoming far too large of their expenditure. But if your house costs 250k instead of a million, you’re much better off. You lie kary, You guys talked at length about property taxes(no politics there?) and then SWE chimed in with his nonsense about sanctuary cities. You don’t even get sarcasm. There will be job losses from tariffs. Maybe even substantial ones that is a fact. That will likely have an effect on the economy, more than passing the Affordable Care Act or saying that bailed out banks shouldn’t go to Vegas during an economic meltdown. My current house costs around 250K. I sold a house in Seattle a few years ago that is now worth about a million. I don’t feel better off. Plus, my taxes here are only a smidgen less than my taxes on the much pricier house in Seattle. All that is besides the point, however. SWE said they moved due to taxes. Not affordability. Taxes. That was a seriously ignorant decision, if true. RE: Matt P @ 12 – I agree. Comparing state property tax rates as a percentage of assessed value does not really give any useful information. I recall reading some study that put us at about the median for all 50 states, but I can’t seem to find it at the moment. You lie kary, You guys talked at length about property taxes(no politics there?) and then SWE chimed in with his nonsense about sanctuary cities.. Lie? Troll much, troll. Lie is a favorite term of the partisan left. They don’t even know what the term means anymore. But here you’re extending it even further beyond just being wrong. There was nothing wrong in my post–but you’re a partisan hack. As to posting politics, yes, I’ll do it, particularly when that’s the discussion. And for the past three years when there’s been relatively little of interest in real estate (just lower inventory and higher prices), delving into other areas was practically necessary to have any discussion here on this site. But that thread I commented on was the first one in forever that didn’t have any political discussion. That is not a lie, and only a partisan hack would make such a claim. But on the topic, you’re a drug addict. This article says a lot of what I’ve been saying for years about partisans (that they are lazy and don’t think), but it goes beyond that into the mind of the partisan hack. Enjoy looking in the mirror reading this. Long-time reader, but not actively participating in dialogue. Unfortunately, I think your affordability index formula needs to be updated. Simply put, the more and more Seattle looks like the Bay Area (where I’m from), the model / formula needs to be updated. The % of income (investment profile) needs to adapt. As an example, in the Bay, say 45% of your monthly income is allocated to real-estate. You are using 30% here. Given the prices and Income levels, you should consider increasing the 30%. Food for thought. Point being, in the Bay Area, asset allocations has higher % allocated to real estate inherently than most of the country. Time to think about upping the 30% to maybe 40%. If you want to be a buyer, you may need to minimize your investments in other assets.